This luxury Villa is 'The villa of Love' what has 3 good size bedrooms with built-in wardrobes with authentic solid pine bedroom furniture (2 with double beds, 1 with single bed and bunk beds). Both double bedrooms with very own bathroom and shower, have sliding doors leading to an ample size seated balcony offering stunning sea views. This is the perfect place for breakfast or an evening drink. Downstairs is a large Kitchen with fridge/freezer, washing machine, cooker/hob, microwave, kettle, toaster, drinking water cooler, iron & board, pots, pans, etc. This spacious villa has an open plan lounge and dining room with leather suites, marble coffee table, large open fireplace with marble hearth, marble dining table with leather chairs, (seats 6),wifi available TV with kodi box, DVD player and lamp. Both lounge and dining room have sliding doors leading to a large outdoor veranda, ideal for lunch and an afternoon snooze. The grounds has a large garden with palm trees and shrubs which has a large step down private sparkling pool to cool down in. Off the kitchen with side door there is a patio area with a professional stone BBQ for relaxing nights in. This property also comes with integrated air conditioning. This Holiday Haven is a 5 star detached Villa with stunning views in the hills of sunny Peyia. This Villa is unique in many different ways which comes with its own extra large step in step down extra large luxurious private pool. Villa Aphrodite is set and huddled on a hillside of Peyia, what has magnificent views, all the people here are warm and friendly and the facilities here are first class! The Villa is central to many beaches only 2 kms away as, Peyia is fast becoming first choice for holidaymakers looking for quality, culture and value for money just like my property. Because my villa sits on the cusp of this beautiful village of Peyia, it also lies on the south western tip of this lovely island of Cyprus. This is probably why I choose it here as so many holiday makers return as it is one of the most colourful and interesting villages on the island! which is only 15 minutes from the beautiful Paphos! Whilst the original Peyia village was originally very small, stone built community of farmers, whose crops were mainly bananas and oranges, Peyia has grown in strength to be the Municipality of Peyia, governing the area from Akamas Peninsular in the west to the edges of Paphos on the east side. Paphos only 15 minutes away by road from Peyia village and the beautiful Coral Bay resort is only a few minutes down the road. Today, Peyia still retains beautiful with its charms but it has grown up to be a very vibrant and welcoming large village, whose population is a mix of many nationalities; Cypriots, expats and more recently the English Learning to live together in harmony, Peyia is developing into a thriving and enjoyable area in which to holiday or simply visit. I speak to many tourists who choose to stay in Peyia to enjoy a taste of traditional Cypriot welcome mixed with the many, more modern western ways they’ve become accustomed to. From research joining the older Cypriot men enjoying backgammon and coffee in the Kafenes to visiting a very trendy wine bar, The Mill, is a must visit what is situated in the centre of the village. Peyia I feel has something here for everyone, what has great pubs, tavernas and restaurants which also has stunning views as you sit and unwind on your perfect holiday. From the reviews everyone loves it here and I hope you will too. Although wheelchair accessible, there is no bed downstairs. Sun loungers and covers, outside patio table and 6 chairs are also provided. We had a lovely time in villa Aphrodite. The house was well equipt and clean and tidy. The water cooler was a brilliant idea and we made good use of it. The pool was lovely and warm and a good size with easy enter safe steps. A little dingy was made full use of for relaxing in the pool. Great views towards the sea. Enjoyed the sunrise and beautiful sunsets from the balcony acessed from both the double bedrooms. Could have done with some beach towels but now just being picky. Walking distance to bars and restaurants which was a boon for us. All in all had a great 9 days. This villa and our experience could have been so much better! It started long before we even arrived, with the villa being removed twice from the website (which left us feeling anxious and suspicious) and it took several calls, texts and emails to both owner and Home&Away to get it reinstated, but even then we weren’t filled with confidence about the booking. Upon arrival, the Villa seemed run down and dirty with a few surprises, like a car on the ‘shady’ driveway (we assume the owners) parked in such a way that we had to park our hire car on the road. The air-con was operated by coin meters, which isn’t an issue, but would have been good to know about it, especially if arriving late at night and you had no coins! There were food splashes and sticky finger prints on the kitchen cupboards, toilet brushes that look about 10 years old, cobwebs under furniture that had obviously been there about a year, broken cupboard door handles (upstairs and down), lightbulbs not working, rips in mosquito netting, pool shower base uncleaned, old and dirty sun lounger cushions that smelled like ‘pickled onions’ and the thickest tide mark around the pool!!! The pool cleaning twice a week wasn’t great either, we still ended up 3 times a day having to net ‘bits and insects’ out ourselves (not sure if the filtration system was working). The bed linen and towels all smelt musty and we had to wash them all ourselves before using them. We had an issue with the WiFi not working (the bill had not been paid) and once again took several texts to get it resolved. I’m sure when it was newer, this villa was a lot better, it’s location was great and the views lovely. It’s being promoted with very old pictures (so not realistic) and some of the ‘excellent’ reviews have been posted by the owners family. Please also be aware that they are marking up for 3 new villas only 20 metres away, so there is going to be some noise coming and no doubt, lots of dust. This villa is basically in need of some serious TLC!!! The Villa itself is very nice, spacious and has a lovely pool. The Villa itself is very nice, spacious and has a lovely pool. The only reason why I have not rated this Villa 5 Stars is due to cleanliness. We found egg cups with encrusted yolk, toilet brushes that need to be in the bin and the towels provided all needed to washed and freshened up. The mattress in the main bedroom needs replacing. A lovely place but the cleaning needs to be vastly improved. The air con system is funded by two metres. This is not a problem to me but should be on the website. I would recommend hiring a car to see as much of Cyprus as you can and there are plenty of shops / restaurants to choose from if you are driving. The villa was in a good position for restaurants, bars and kiosks all within a short walk. The beaches at Coral Bay and Agios Georgios a short drive away. TV channels channels couldn't be tuned in. WIFI stopped working after 4 days. Stone bar-be-que badly cracked all over. Villa required a good cleaning both inside and out. Villa Aphrodite is a great villa with a fantastic sea view. It is located in a peaceful residential area yet within a short distance of all local village amenities and a short drive to the larger resort of Coral Bay. The outdoor space and pool area were fabulous and the perfect place to soak up the sun and cool off in the large swimming pool. We did experience an issue with an air conditioning unit but this was resolved within hours after contacting the villa owner, Richard. 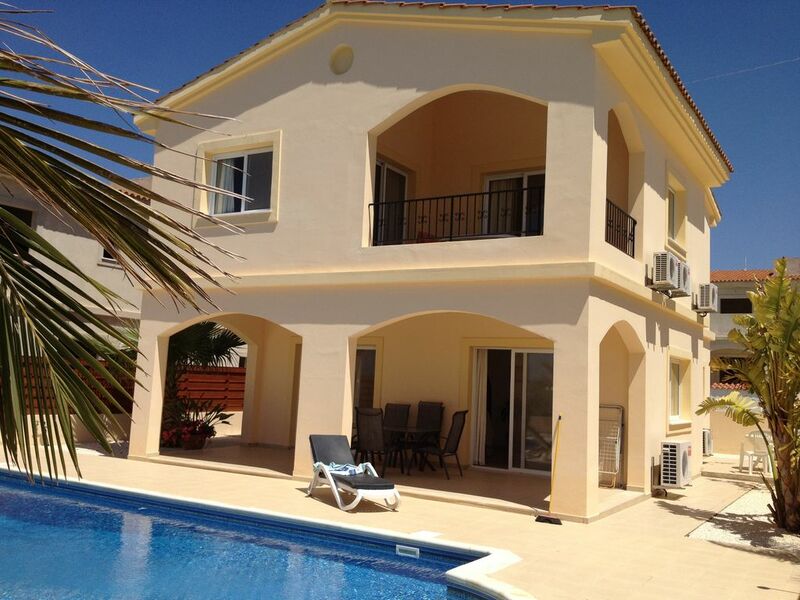 The villa offers great value for money and has everything needed for a fantastic holiday in sunny Cyprus. The villa is immaculately presented and has everything you need to fully enjoy your stay. Will equipped and within walking distance from a supermarket, kiosk, bars and bakery. You can take a short taxi ride to coral bay or paphos where there are plenty of bars and restaurants to sample. Richard kept in touch with us throughout our stay recommending several areas of interest for us to visit. Throughly enjoyed our time there and would definitely recommend it. 3 kilometres from coral bay, lies Peyia village, nestled at the bottom of the hills with a view of the most photogenic stretch of coastline in Cyprus. You can see from Paphos town to the silhouetted peak of Ayios Yeoyios which marks the beginning of the untouched Akamas peninsula. Peyia village & Square is very picturesque & a delight to stroll around the pine-scented narrow streets & alleyways. There are many old & interesting stone buildings & ancient places to see. (Christian basilicas ruins with mosaic floor & Roman tombs carved into the cliffs on outskirts). There is also plenty of shops, supermarkets, bakery, butchers, fishmongers, chemists, frozen food shop, doctors banks, etc., the nearest being 3 min walk. Water park, animal park, reptile park, carting, beach, golf, archaeological sites, nature reserve, airport, are all within 10-30 min drive.